[FREE 1 eXtra BTU 2504] Doulton filtadapt Pebble, Counter-Top system c — SHOP N' SAVE [优质生活] quality living & effortless shopping! Home Doulton M12, Counter-Top [FREE 1 eXtra BTU 2504] Doulton filtadapt Pebble, Counter-Top system complete with BioTect Ultra filter. [FREE 1 eXtra BTU 2504] Doulton filtadapt Pebble, Counter-Top system complete with BioTect Ultra filter. FREE shipping via courier service w/ tracking id. Doulton drinking water system, Trusted by million. Doulton water provide, healthy, natural, safest, finest, great tasting minerals water for whole family to enjoy! Doulton filtadapt Pebble is ABS, BPA FREE housing which is extremely easy to install and uninstall, making it portable and, therefore, the ideal solution for people who move house on a regular basis. It fits to most common threaded kitchen taps via a diverter valve. 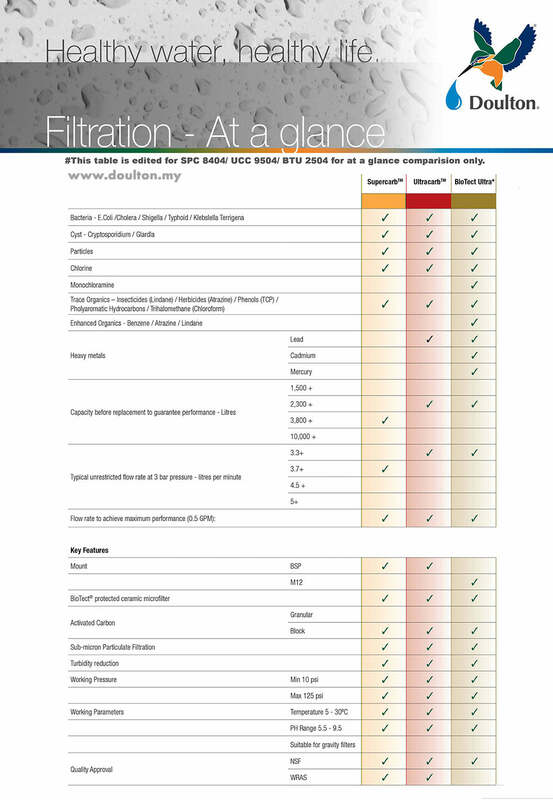 Filter life span: optimum performance 6 -12 months / 2300 litres. Self collection/ Free trial drink! # Why we should to remove Lead, Mercury & Cadmium from drinking water?